The shootings of unarmed Missouri teenagers Michael Brown and Vonderitt Myers Jr. have sparked huge protests and called attention to the systematic abuse of African-Americans by police. But Brown and Myers are not the only victims. According to the FBI, at least 404 Americans were killed by police last year. The real number is probably much higher, since the FBI relies on voluntary reporting from local police departments, and many killings went unreported. Though the FBI does not identify victims of police shootings by race, it is safe to assume that African-Americans were disproportionately represented. The Brown and Myers protests are addressing a larger problem. American police departments are out of control. 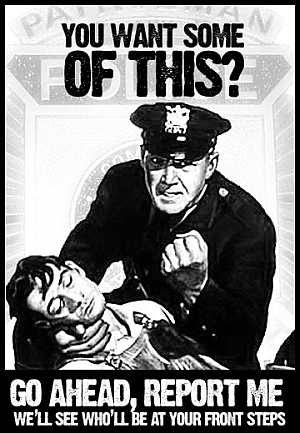 Beatings of innocent civilians are common, killings are shockingly frequent, and African-Americans are the main victims. Black Americans fear for their own safety, and the safety of their children, at the hands of police. Even white Americans fear police. When I lived in high-crime neighborhoods of San Francisco, California, I was more worried about the police than the criminals. On one occasion I was attacked by two policemen simply because they thought I was not being sufficiently respectful. They repeatedly slammed my head into a concrete wall and then into the pavement, gave me a sprained arm, and crushed my wrists leaving me with permanent nerve damage. At the police station they took turns with one holding me and the other punching me in front of fellow officers and the receptionist. Based on conversations with other Americans in big cities, especially black Americans, my experience was not unusual. When I filed a complaint against the officers who abused me, the police (including witnesses) all lied and the officers were exonerated. Lawyers told me that police in San Francisco abuse thousands of people every year, routinely lie about it, and are virtually never punished. Lawsuits are only successful in extreme situations with high medical expenses. Few if any other nations have such violent police. In England, not one person was killed by police last year, and the English police only discharged weapons on three occasions. In 2012 a harmless, completely non-violent Madison man named Paul Heenan was gunned down by a mad dog cop named Stephen Heimsness. This vicious police bully had a long history of abusive behavior, including firing his gun wildly in a parking garage and beating an innocent man into a bloody pulp. Yet he was allowed to commit first degree murder – killing a harmless, unarmed man for the crime of not following police orders – without spending a single day in jail. Only an aroused community response finally forced him out of the Madison Police Department. Why are American police so violent? One reason is that the USA is a violent society. It was founded on genocide and slavery; greedy psychopaths from all over the world emigrated to the USA where they could be free from social restrictions (such as empathy and responsibility for others) and fight and claw their way to wealth and power. People willing to kill Indians and exploit African slaves could easily make a lot of money. And when Africans and Native Americans resisted oppression, they were violently abused or killed. On top of this “frontier heritage” came the ethnic organized crime gangs that ran American cities: Irish, Jews, and Italians were especially notorious for forming ethnic mafias. Today, other ethnicities including Blacks and Latinos continue the tradition, dealing drugs and getting in gun battles. The police may feel they need to be even more violent than the gangs if they are to maintain the upper hand; and since organized crime has so much money, the police end up becoming corrupted and criminalized. Another reason for the psychopathic violence of American police is the training they get from Israel, a nation whose soldiers and police routinely murder children for sport. A long list of US police departments, including the San Francisco Police Department that abused me, are trained by Israel. Then Department of Homeland Security Secretary Michael Chertoff, a US-Israeli dual citizen, signed an agreement with Israel in 2007 that greatly increased the Israelification of American police. The increased pace of police shootings may be the result of US police being trained by a nation that specializes in genocide. Today, Americans are becoming increasingly aware of the problem of police violence and racism. Brutal police actions are getting caught on video and posted on the internet, where lying police officers cannot make them disappear. For example, a recent Press TV story was headlined: “New video shows US police shot black man 45 times like ‘firing squad’.” The story concerned one of many such videos showing police committing cold-blooded murder. The victim, Milton Hall, had committed the two crimes of being black and mentally ill.
African-Americans, like Palestinians, are tired of being shot down like dogs. If America does not reform its police departments soon, an American intifada – civil unrest or even long-overdue revolution – may be the result. Whites 42.1%, Blacks 31.8% of arrest-related homicides. Blacks 52.4 percent of homicide offenders & 28.4% of arrests for assault.